Part I does not contain fractions in simplest form and regrouping on additions problems. This bingo set does! Save your time writing out bingo boards. 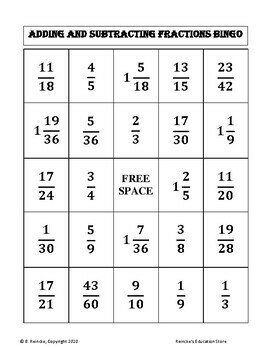 This document contains 30 pre-made bingo boards to make an engaging, fun activity out of adding and subtracting fractions with unlike denominators. There are 36 adding and subtracting fractions problems. 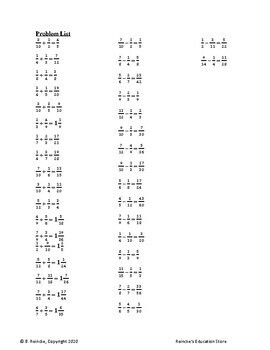 The addition and subtraction problems are listed on the preview document. All problems involve fractions with unlike denominators. They must solve the problems given by the teacher and find the answer on the board. Answers are in simplest form and some addition problems must be regrouped to mixed numbers. 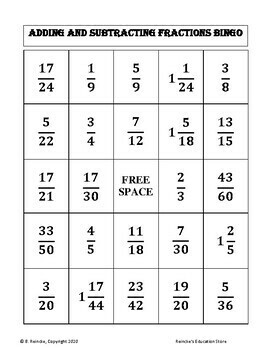 The document also contains the addition and subtraction of fractions cards for the teacher to read to the students. It's an excellent resource to use in any classroom. 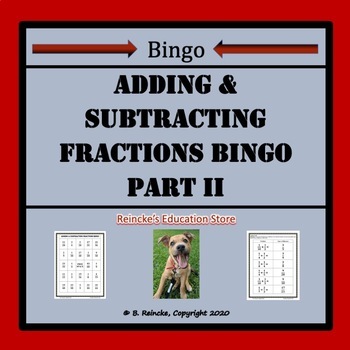 Your students will have a blast practicing addition and subtraction of fractions.